Pumpkin fries, butternut squash fries - healthy fries! Yum yum, french fries. Yum yum, pumpkin fries. Yum yum, butternut squash fries. 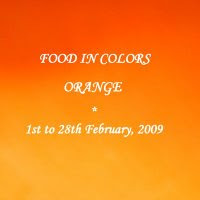 For Food In Colors-Orange in the month of February, I am going to show you a super-healthy snack which cuts down on the carbo in potatoes and fats in deep frying. How about some Baked Butternut Squash Fries? 3. Before serving, you can add a small cube of butter on the pumpkin fries for richer taste. It is optional, really!